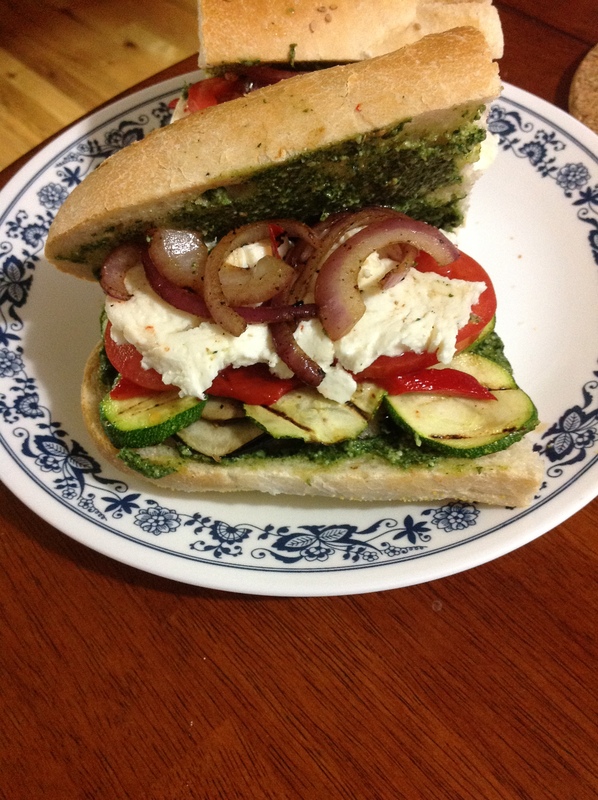 I have a thing for grilled vegetables on my sandwich. Whenever I go to sandwich shops, I pretty much always look for the same kind of sandwich. Grilled vegetables, a spread of pesto, some fresh mozzarella and if I am really feeling up to it, some grilled chicken. Tonight, I wanted to keep things relatively simple and leave the chicken out. I was very excited to finally try to make this at home and I was very pleased with the results. I ended up with 8 sandwiches (6 of them wrapped and ready for my husband for his lunches). I grilled my vegetables on a cast iron grill but I think in the future, it would be easier and faster to broil the veggies in the oven. It was definitely worth the wait and my husband and I really enjoyed our dinner. Place bell peppers on an aluminum foiled tray and blacken the bell peppers under the broiler, turning every 5 minutes until the peppers are blackened. Place bell peppers in a large plastic bag and seal the bag. Let them sit for at least 5-10 minutes to steam. Remove the skins of the peppers and any of the stems and inside seeds. Chop bell peppers into smaller pieces. Slice mozzarella into think slices as well. Slice Italian bread so that the top and bottom halves are still connected at one side. Spread pesto sauce on both sides of the inside of the bread. So, what is your favorite sandwich? Yum delicious! My favorite sandwich is curried chicken salad pita! ooh 🙂 Do you have that recipe posted? I would love to try it! Yum! I remember that recipe! I am definitely going to try it this summer. I have a thing for avocado lol so I will definitely be putting that in! I love meat in my food, but this looks so hearty and flavorful that I want a big bite of it! Beautiful! I don’t often just do vegetarian foods but when it is hot out (summer in NY) I want light foods. My husband loves when I cook meats but even he loved this sandwich 🙂 Thank you for visiting me!